I have four of the delicious polishes from the Zoya Ornate Holiday collection to show you over the next few days. I'm starting with the lovely Zoya Blaze. I personally don't know any women named "Blaze" and I think Zoya's starting to reach a little with their names, but that doesn't mean I don't love the polishes! They should start going into ethnic names. I can think of a ton of good Irish names they haven't covered yet. 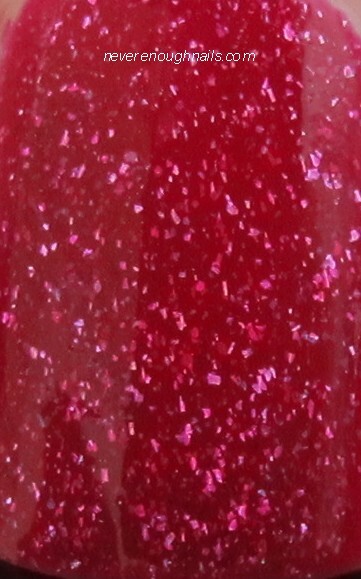 Anyway, Blaze is a gorgeous raspberry/cranberry with silvery shimmer flecks. Zoya calls this finish "glitter glam crystal". It's kinda like tiny smooth glass-fleck shimmer. The coverage of Blaze was absolutely fabulous. I did a medium-thick first coat and could have worn it just like that. I know my mom will wear this at one coat. These pictures are of two coats and it's perfectly opaque. The application was also really excellent! Blaze reminded me that I've been missing my Zoya polishes lately. Zoya Blaze is available now on Zoya.com!